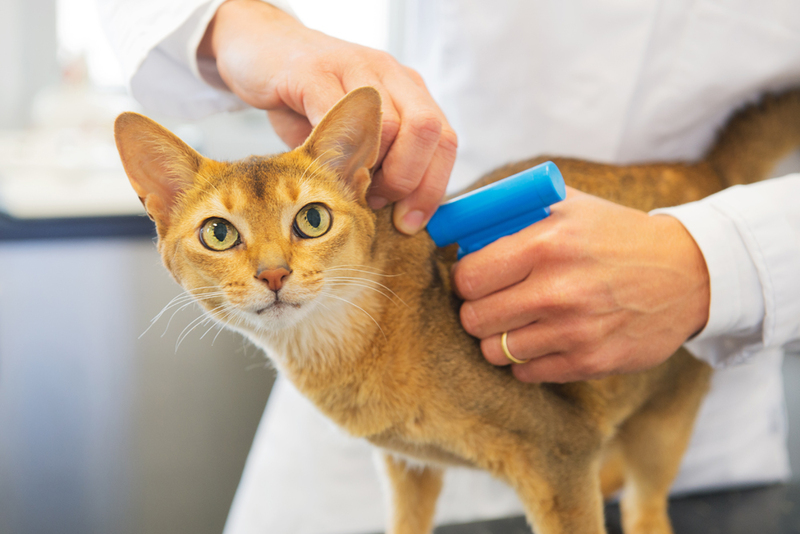 Pet microchipping is a valuable service you can seek out for your beloved animal friend. No, it's not quite a GPS device—but it CAN improve the chances of reuniting with your cat or dog if it gets lost! At The Village Vet, our Baltimore veterinary team is proud to provide this simple, safe, and affordable service for pet owners who are looking for a little extra insurance in the unlikely event of a missing pet. Dogs and cats can and do get lost from time to time: they may escape, run away due to bad weather or other stressors, wander due to territorial or reproductive urges, or in some cases be the victims of theft. Sadly, many of the animals who go missing are never reunited with their human families—even if they've been returned to an animal shelter or veterinary hospital! A pet microchip can prevent this sad reality. It's a small device about the size of a single grain of rice and is implanted just below your pet's skin. This chip digitally stores a unique identification number, and when the device is scanned by a microchip reading device (most shelters and vet clinics have them), a radiographic signal is sent to the microchip database registry. The registry can then look up the contact info associated with your pet's unique ID number, and get in touch with you to let you know your pet has been recovered. It's safe. Microchips are invisible to the naked eye. You or your pet won't even notice it's there, and no anesthesia is required to implant it! Plus, your contact information that will be digitally linked to your pet's microchip identification number is securely stored, so your privacy will be maintained. It's quick. A Baltimore vet can simply use a hypodermic needle to insert the microchip. This can be done while your pet is awake during a simple in-office visit. It's effective. Unlike collars, microchips can't fall off or be taken off. And research shows that pets who are microchipped are significantly more likely to be reunited with their human families after they've gone missing compared to pets who aren't. Contact The Village Vet now at 410-367-8111 to schedule a consultation with a veterinarian in Baltimore near you. We'd be happy to get your pet protected with a microchip and provide any other services your beloved friend needs! Call us today.